"I'm going to do everything really fast so the time will go fast so it can be the first day of school." I heard things like this all weekend. Lucas and Alex both were beyond excited for school to start. I was totally grateful for that as their excitement helped calm my nerves. Monday morning came. I heard Lucas' alarm go off. "Awesome!" he said. He hurried in to wake up Alex. 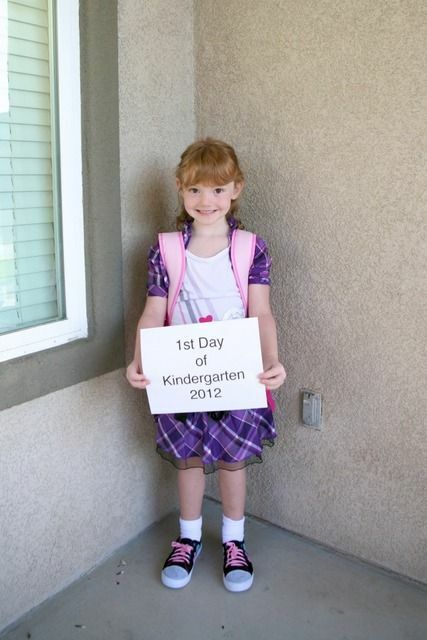 She took a little convincing it was time to get up, but was soon very excited that it was her first day of Kindergarten. Lucas was excited to be the big man on campus- or so he seems to feel- as in his words he has spent a whole year at the school so he knows where everything is. It was quite cute watching him take Alex around. Alex admitted for the first time she was a little nervous- I assured her this was okay and that she would do wonderfully. 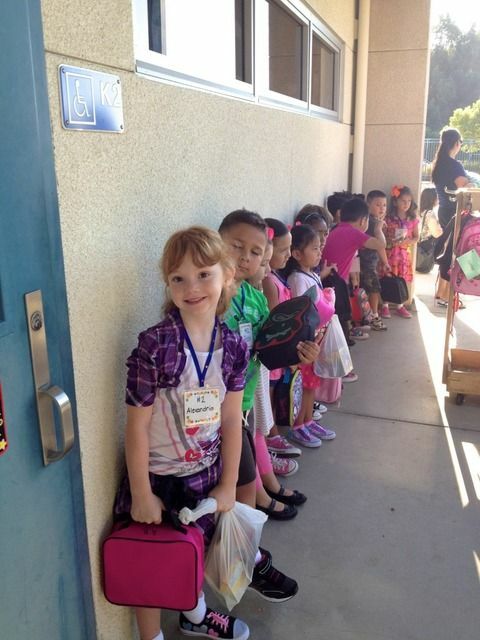 She seemed to quickly forget these nerves when we arrived at school. 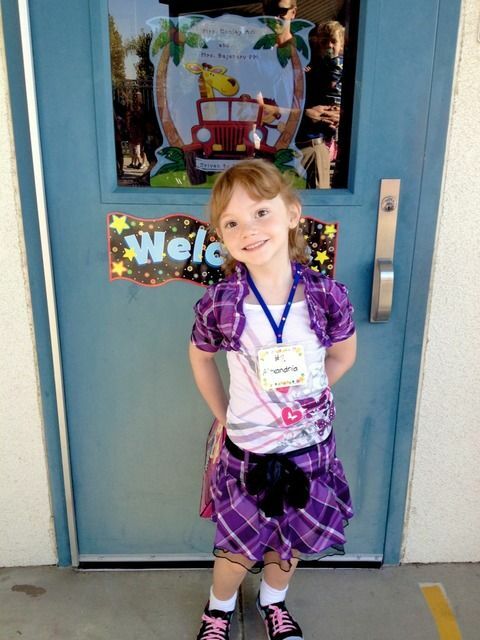 Alex found her name tag, hung up her backpack and waited with the other kids to go into her class. For those of you who live in cold places- in California the schools are open and each classroom's has it's own outside entrance--this was so weird to this Illinois girl at first. Lucas was also very excited to have a friend from church, plus a few friends from his class last year in his class this year. Before Lucas started kindergarten I created a video about him in honor of that (you can see it on my YouTube page here)-and well I didn't want Alex to suffer from the middle child syndrome so I created one for her too. It is a bit long- but if you know anything about my past videos- you know I try and do them right and make them entertaining, so I really do think you will enjoy it and it would make my day if you watched it. And since their first day was Monday and today is Wednesday, luckily the reports are all positive-- but more about that tomorrow during Proud Mommy Moments. They look so excited in the pictures. I hope they had awesome first days. And again, loved the video. I can't believe school has already started for you! Wow. Great pictures. They both look so happy. I loved your video. What a great gift for her to have and cherish. Boy, when you said she could sleep anywhere, you meant it! Funny. Adorable children, sweet family. They look so adorable. I've heard things like that before. like go to bed early or sleep until school starts. 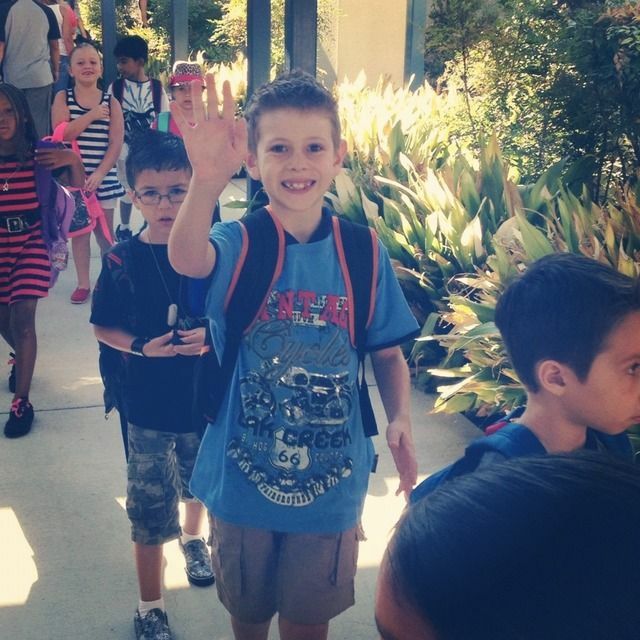 school starts here in a couple weeks and I think I'm just as excited as my son. How adorable! What a sweet video too! It makes you realize how fast the years go. So sweet. The video is tear inducing. 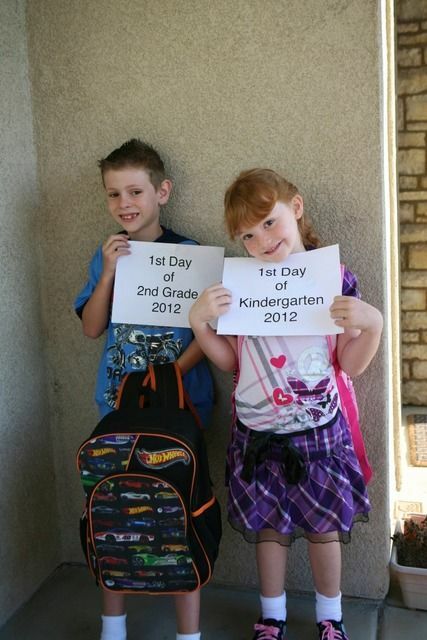 So glad they were looking forward to school and that it was as much fun as they expected. They are both just as cute as they can be. I hope they have a great year! This is truly just warming my heart! Those eager faces and smiles....LOVE. That was so fun to watch Em! The sleep anywhere section just made me laugh and laugh! So funny. I loved every part though, and both your kids looked so cute on their first day!!! I am with Rachel, the sleep section was tooo funny! hahaha. That girl is hilarious. Great video. Oh the joys of the first day of school, the mixed emotions one has. 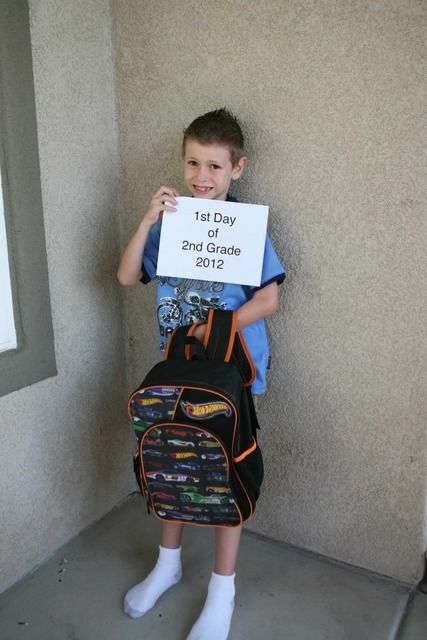 I love your idea of having signs made for them, I do have a first day of pre-k and k and 1st grade picture but no sign. Hopefully I can make up which is which haha and that video is great! Emily...I am so thrilled that you made this. Your talent for these things is stunning. It was just so great to see Alex over the last five years. I loved seeing her smile and grab Lucas by the hair, and dance and dance, and squeal at the beach. I felt her gusto watching all the brave things she tried, and the sleeping videos are such a scream. Oh sniff...I miss her. I was so glad to hear her little cooing voice again from when she was one. Ryder's voice now reminds me of that. Another of my favorite parts was hearing your voice, Emily, in the background. I'll never figure out how you always choose the perfect music for each part too. Superb! LOVED IT!!! Wow...Loved it! Oh my gosh!! That made me cry! Oh, the first day of school. They look so happy and excited! We're still three weeks out from school so I'm happy for you. Your kids are adorable. That kind of school would throw me off too! Alex is adorable in her first day outfit!